SAFER aims at implementing pre-operational versions of the Emergency Response Core Service, for the European program Copernicus-GMES Fast-Track Services. Funded under 7th FWP (Seventh Framework Programme) into the Research area: SPA-2007-1.1-01 Development of upgraded capabilities for existing GMES Fast-Track Services and related (pre)operational services, SAFER aims at implementing preoperational versions of the Emergency Response Core Service. 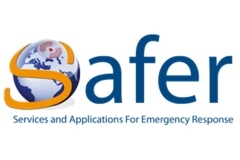 SAFER reinforces European capacity to respond to emergency situations: fires, floods, earthquakes, volcanic eruptions, landslides, humanitarian crisis. First priority is the short term improvement of response when crisis occurs, with the rapid mapping capacity after disastrous events, including the relevant preparatory services (reference maps).The content of this first action is consistent with the definition of the preparatory action recently decided. The second priority is the extension to core service components before and after the crisis. It targets the longer term service evolution, through the provision of thematic products, to be added in the portfolio of services. The main performance criterion is the added-value of products with risk-specific information. In SAFER, thematic products will cover mainly the meteorological and geophysical risks. SAFER includes also some transverse actions, with the objective to increase added-value of the overall service chain. Testing the reference maps database at component level. Users involvement is a key driver and a specific task addresses the federation of the key users, both for interventions in Europe and outside Europe. The emphasis put on quality assurance and validation methodology is reflected in the work plan. The consortium is built around a core team of European service providers, already involved in the former or on-going projects, in the frame of FP6 or ESA programmes. A wide network of scientific partners and service providers will extend the European dimension, in particular in the new member states.